Our Mitsubishi LV Laser features superior cutting power and high-speed processing accuracy. With our Amada line up of three CNC turret punch presses, we are able to meet our customers’ diverse punching requirements. Our precision Amada press brakes deliver consistent production quality through high accuracy components. Our Virtek LaserQC provides 100% flat part inspection in only a few minutes to dramatically increase throughput. We offer three different kinds of expert welding services to meet customer requirements: Spot welding and MIG/TIG. Our SteelMaster four-head graining/deburring machine offers more versatility to deliver acceptable, burr-free parts to our customers. Our hardware and assembly services support Salem’s mission to be your one-stop job shop. The Haas CNC milling machine is designed to meet the needs of modern milling requirements from now and long into the future. Our customers receive added delivery benefits through better product control and shorter lead times. Join us for a guided tour of our facilities and get a better understanding of how we can take your project from plan to finish. 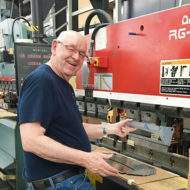 At Salem Metal we pride ourselves with our people & our reputation as a family-run, full-service shop serving all industries. 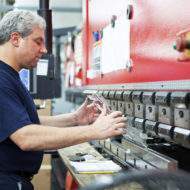 Our in-house capabilities can handle everything from design, engineering, to sheet metal fabrication & finishing services. © 2019 Salem Metal, Inc.